The message from Microsoft Ignite 2015 was all about enablement through technology platforms with a big focus on Cloud, identity and security. Microsoft Australia Director, Developer Experience & Evangelism, Sarah Vaughan, opened the event by talking about the state of readiness in Australia for the next stage of IT expansion. She spoke about the challenges facing Australia including where the nation sits relative to the rest of the world, particularly in the maths and science disciplines and then went on to say that innovation through technology platforms was the key to growing a more robust knowledge economy. This was a noticeable shift in messaging from a company which has traditionally talked about itself in the abstract. Vaughan then introduced Microsoft corporate vice president enterprise mobility suite, Brad Anderson, who delivered the main section of the keynote address and began by talking about what an exciting time it was for the vendor in Australia and specifically the launch of its first retail store outside of North America. “The store is about the relationship we want to have with the community. The response has been absolutely amazing for us,” he said. Anderson went on to explain that Microsoft donated in excess of $4.8 million of technology and software to 11 non-profit organisations as part of the store launch. “Our mission is to empower every person and organisation on the planet to achieve more." The retail store launch and the message coming from the keynote followed the same theme of brand engagement through platforms. Whether it is retail, mobile, desktop or Cloud, the vendor said it wants to know more about its users so that it can use that data to deliver better outcomes. While the store is an exercise in showcasing the brand, Ignite was about framing the brand in a broader context of the innovative economy and how Microsoft can enable partners and customers to add value through its products. “We want to make personal computing more personal. The device that we use should understand who we are, what we like to do and what our preferences are. It should help us and guide us in our personal life and in our business life,” he said. He went on to talk about the company’s strategy when it comes to Big Data, saying that the opportunities in the analytics space were only beginning to be realised by many organisations. 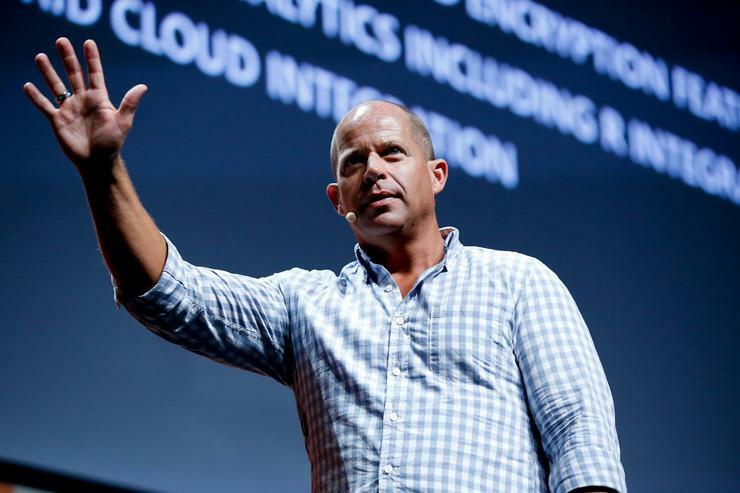 Anderson went on to tout the vendor’s Cloud success saying in the year since the vendor built its first Azure datacentre in Australia, it has seen a fourfold increase in the number of organisations using the platform. “50 per cent of the enterprise organisations in Australia are now using Azure and it is interesting if you look at the actual revenue on Azure, 40 per cent of all the revenue is coming from start-ups, SMBs and ISVs. Anderson then announced six new partners to come into the Azure fold: Rackspace, Buttonwood, Data#3, Datacom, Dimension Data and SAASPlaza. He also revealed that NEXTDC and Megaport now offer express routes into Office 365 via each’s infrastructure. “As professionals, everything you do has to be secure. Security is by far and away the number one concern for organisations around the world,” said Anderson. He explained that identity management was not only the key to enterprise mobility, it was the key to security as well. “Our users no longer work on one device behind a firewall. They are using more devices, utilising more applications, interacting and collaborating with more people. “Corporate data, corporate applications are no longer safely behind the firewall, much of the data has now moved into the Cloud. The perimeter that we always based our security on as an industry has evaporated and we have to think about security in a different light. According to Anderson, the key to this is identity management. He said that the challenge for IT was balancing empowerment with protection. He said that identity is the new perimeter of the network and said that Cloud-based security was the key to Microsoft’s approach. For Microsoft, the solution is its enterprise mobility suite. Anderson explained that by authenticating an identity through Azure active directory, organisations can achieve better security outcomes. “Device of choice, with Identity being managed by Azure active directory, applications integrated into Azure Active directory then everything managed by Enterprise Mobility Suite,” he told attendees. Anderson then revealed that Enterprise Mobility Suite was the fastest growing product in the history of Microsoft. Anderson went on to say there were 110 million devices around the world using Windows 10. “When we built Windows 10 we did it with the enterprise in mind. We built Windows 10 with the modern security attacks in mind. We are delivering Windows as-a-service and you will have to fundamentally change the way you manage Windows, continual innovations will be coming down to give new capabilities and make users better. “Customers are no longer passive consumers of our products and services. They are now an active part of everything we do.